The MC9090EX mobile computer maximizes mobile worker productivity by providing a flexible, always-on connection to the network. The MC9090EX provides the most advanced mobile operating systems available with a choice of a familiar Windows environment or an application-specific environment. Additionally, it supports a variety of multimedia applications and its Intel 624 MHz enhanced memory ensures retention of mission-critical data. The Bluetooth option allows users to wirelessly synchronize and print. The MC9090EX's rugged construction, which passed stringent drop and tumble tests, dramatically reduces repair and downtime costs while its 3.8" screen makes it easy to read. The pistol grip allows for comfortable and efficient use in a variety of applications such as manufacturing, delivery and retail floors. MC90xx Fork Lift Cradle. Must order voltage specific power supply (Part# PWRS-14000-251R) or (Part# PWRS-14000-252R) and power input cable (Part# 25-103872-01R) separately. 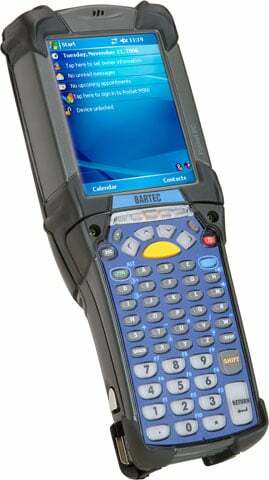 The BARTEC 17-A129-0KK0HCEFA600 is also known as 17-A129-0KK0HCEFA600	or 17A1290KK0HCEFA600	.